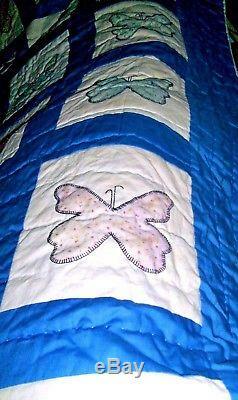 ONE OF A KIND HANDMADE VINTAGE BUTTERFLY QUILT IN A FULL SIZE QUILT. THIS ONE WAS MADE IN THE 1940'S BY MY GRANDMOTHER AND AUNTS DURING HARVEST TIME IN NEBRASKA. 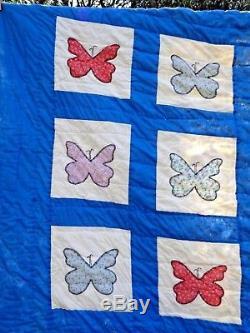 FROM WHAT I UNDERSTAND THE FAMILIES WOULD GATHER AT THE PARENTS HOME TO HELP WITH THE HARVEST CROP, CAN FOOD AND QUILT. THEN THEY WOULD GO TO EACH OTHERS HOME OR BACK TO THEIR OWN. 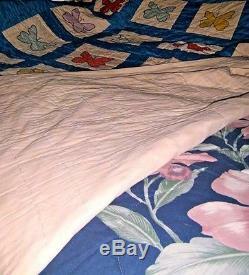 THE QUILT IS IN GREAT CONDITION FOR ITS AGE. IT HAS MANY PAISLEY PRINT EXAMPLES THAT WAS VERY POPULAR IN THE 1920'S&30'S. 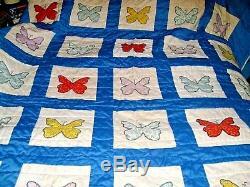 LOVELY, GRACEFUL BUTTERFLY SQUARES WITH NEATLY STITCHED HEMS, VERY PRETTY SHADE OF BLUE BORDERS ON A WHITE BACKGROUND. 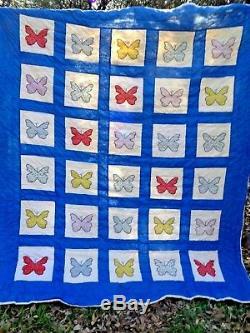 ONE BUTTERFLY SQUARE HAS A MARK ON IT THAT I HAVE SHOWN IN A PICTURE ABOVE. WHAT IT IS OR HOW IT GOT THERE I DON'T KNOW. ITS ALWAYS BEEN THERE FROM MY MEMORY. BACK IS SOLID WHITE AND THE LINING IS COTTON. THE BATTING IS STARTING TO SHIFT A LITTLE. I DIDN'T SEE ANY HOLES, TEARS OR ANYTHING LIKE THAT BUT ITS POSSIBLE MY OLD EYES MIGHT HAVE MISSED SOMETHING. 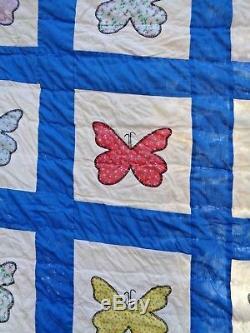 BE SURE TO CHECK OUT MY OTHER LOVELY QUILTS I HAVE LISTED.. I CONSIDER ALL REASONABLE OFFERS SO DON'T BE SHY! P LEASE COME AGAIN AND SEE THE ITEMS I WILL BE LISTING IN THE FUTURE. SOME VERY OLD CLASSIC FAMILY HEIRLOOMS, SOME SURPRISING FINDS FROM SALES, SOME VERY RARE OR HARD TO FIND. AND THE JUST PLAIN UNIQUE OR UNUSUAL. ALL PICTURES AND DISCRIPTIONS ARE GIVEN IN THE LISTING. PLEASE ADD ME TO YOUR FAVORITES LIST AND CHECK BACK AGAIN. 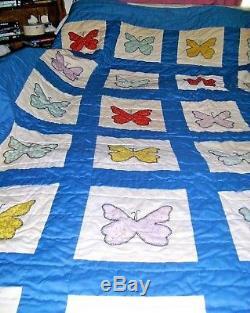 The item "GORGEOUS HANDMADE/HAND STITCHED VINTAGE 1950'S BUTTERFLY QUILT-FULL 86x78" is in sale since Thursday, November 30, 2017. 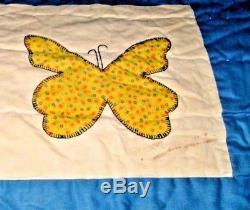 This item is in the category "Crafts\Handcrafted & Finished Pieces\Quilts". The seller is "bro_don" and is located in Whitney, Texas. This item can be shipped to United States, Canada, United Kingdom, Denmark, Romania, Slovakia, Bulgaria, Czech republic, Finland, Hungary, Latvia, Lithuania, Malta, Estonia, Australia, Greece, Portugal, Cyprus, Slovenia, Japan, China, Sweden, South Korea, Indonesia, Taiwan, Thailand, Belgium, France, Hong Kong, Ireland, Netherlands, Poland, Spain, Italy, Germany, Austria, Israel, Mexico, New Zealand, Philippines, Singapore, Switzerland, Norway, Saudi arabia, Ukraine, United arab emirates, Qatar, Kuwait, Bahrain, Croatia, Malaysia, Chile, Colombia, Costa rica, Dominican republic, Panama, Trinidad and tobago, Guatemala, El salvador, Honduras, Jamaica.